Happy Monday. Thanks for joining me this week! The world won't come to an end if you forget to take a photo. I have resisted (without too much effort) the urge to leap out of bed at 11:00 p.m. and snap a photo when I realized I'd missed one that day. It is sort of like dieting. If you slip one day, just start back the next. OK, it is easier than dieting. Fortunately, I haven't missed too many days. I've also decided it is OK to capture two interesting things from the same day. Particularly since it is Spring and so many things are changing in our yard and lives at this time of year, it is OK to snap quite a few different images. It sort of makes up for those days I forget to photograph. It is best to scrapbook these photos as you go. I can't imagine they would ever get done if I left them till the end of the year. This is actually one of the best parts. I have a quarter of my 2009 album done! That has never happened at this point in the year. I'm still a theme person. I try to take photographs of random stuff each week but invariable start looking for themes. 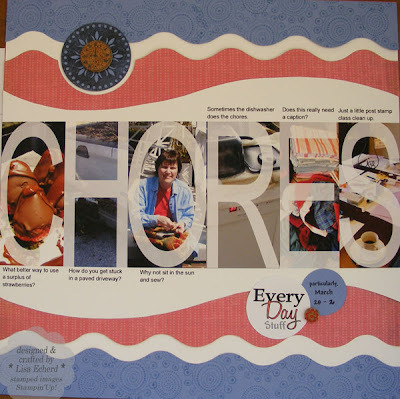 That is how we go the CHORES layout above. To create the photo collage in PSE, I typed out CHORES in white and changed the transparency to 75%. I added each photo and then cropped with the marqee tool. 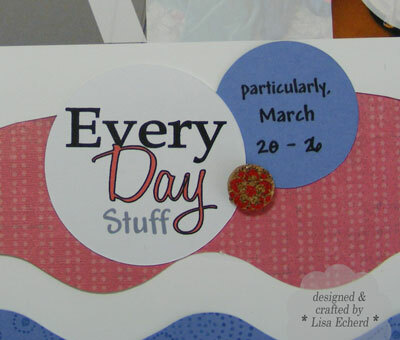 The design was inspired by a layout in Scrapbooks, Etc. April 2010 issue. The waves were cut with a Creative Memories tool. I'm not sure it is still available. Every time I think I might list it on E-bay, I find a use for it. One of the circle designs was stamped with the Medallion background stamp in black pigment ink and then embossed. I then just cut out the center circle from this design and added the cork clock button. The other circle designs were typed in PowerPoint using the WordArt tool. 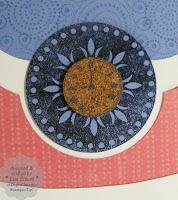 Ingredients: Stamps: Medallion, Trendy Trees, Polka Dot Punches from Stampin' Up! I did this last year....well I tried. I took the photos and journaled but never did a layout. I am trying again this year. My daughters are doing a picture a day and posting them to facebook, flicker and Tumbler. Good for you for sticking to it. I have yet to make a layout this year. What a great layout! And it's real scrapping, not digital! It's great to have the company.